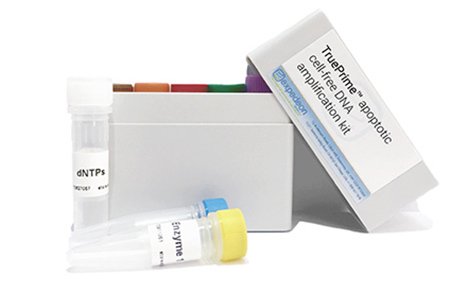 TruePrime is an apoptotic cell-free DNA amplification kit, launched under the Expedeon brand, which enables accurate DNA amplification using cell-free DNA (cfDNA) obtained from plasma, serum, urine, cerebrospinal fluid (CSF), or many other bodily fluids. The TruePrime kit uses a novel multiple displacement amplification method to overcome common limitations with the analysis of bodily fluid for cfDNA analysis. By exponentially amplifying cfDNA derived from apoptosis, the kits provide users with excellent sensitivity, error-free amplification in high yields and a streamlined workflow for reduced hands-on time.